The season for baseball is fast approaching. Our first ball practice is this week. My husband and son made a pilgrimage to the Minnesota Twins training camp in Ft. Myers, FL, yesterday. Fantasy baseball drafts are near. Baseball fever has officially HIT. One of the ways I captured my son's attention way back in the fall when we first started homeschooling him was through his first love: BASEBALL. We did a baseball lapbook. In First Language Lessons we copied the names of all of the Atlanta Braves players as examples of proper nouns. We play Topps Attax online (a great, free online game for kids) and in person. I found lots of baseball math activities online. I ordered several first reader books about baseball players. For Black History month my husband decided to start a read-aloud with the kids that GMan got for Christmas, Jackie and Me. Each evening before bed we all sat in the living and listened to daddy read this book. 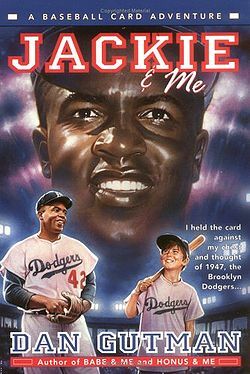 Not only was it a great biography about Jackie Robinson, but it also was such an accurate portrayal of the civil rights struggles Jackie and all other black Americans dealt with. "Wait a minute," Jackie said, holding up one hand and clutching his stomach with the other. "I can accept that traveling through time may be possible. I may even be able to believe a white kid could turn black. But Black History Month?" At that, Jackie let out a loud guffaw that woke the baby. "You've got to be kidding! White kids from Kentucky studying our history? Now I know you're crazy!" My nine year old daughter very much enjoyed this book, too. She picked up on the deeper elements of the book, but the story also kept my six year old son's attention, too. Today my husband asked me to see about getting more of Dan Gutman's baseball card adventures. It was my lucky day - Amazon offers them in their 4 for 3 promotion. Much as we have built a library of American Girl books for my daughter, these books will go into my son's baseball library. You don't have to have a baseball fan to enjoy these books - they're just good reads for the whole family.